After again amending its bill to create a consolidated primary -- presidential and other offices -- on Monday, May 11, the Nevada state Senate passed SB 421 on Tuesday afternoon on an 11-9 party line vote. Majority party Republicans in the Senate voted in favor of the measure that would create a presidential primary and couple it with the primaries for other offices in the state. The latter, typically in June, would be moved up to the last Tuesday in February. 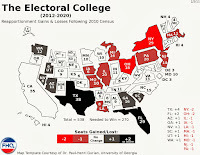 That not only tamps down on the costs associated with the new presidential primary, but is also in line with what the Republican National Committee has been quietly pushing for while keeping the Nevada delegate selection process early on the presidential primary calendar. And while that potential move from caucuses to a primary is of note for Republicans, perhaps more interesting is the Democratic reaction to the bill in the state Senate. Nevada Republicans have reason to want to go along with the national party on this one. 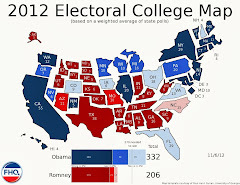 They control the levers of state government in the Silver state, but the national party has sway over which states are among the privileged few at the beginning of the presidential primary line. Nevada is now among that group of four. For Nevada Democrats, however, there is some concern that trading out the caucuses/convention process for a primary will hurt the party and its protected position on the calendar with the Democratic National Committee. 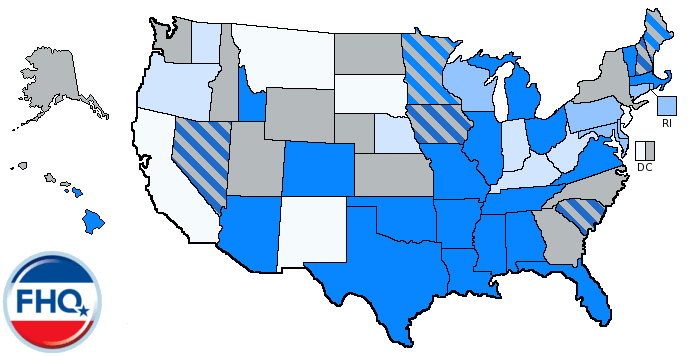 The DNC added the Nevada caucuses to the list of carve-out states for the 2008 cycle and has for three cycles now specified the dates of the "caucuses" in Nevada in the national party delegate selection rules. SB 421 has Nevada Democrats in a bind in switching the process to a state-run primary election. The national parties, then, are pulling the state parties in different directions on this issue. The RNC wants a Nevada primary to reduce the amount of chaos, if not mismanagement, of the caucuses process by the Nevada Republican Party. However, DNC rules call on Nevada to hold caucuses and not a primary. This sounds like Nevada Democrats might lose their early status (in the future) only there are a couple of outs for them in all of this. One is in the legislation that just passed the state Senate and the other is in the DNC delegate selection rules. First, layered into the newly amended SB 421 is a provision that instructs the Nevada secretary of state to conduct a presidential primary election (on the last Tuesday in February) if 1) he or she does NOT receive written word from a national party chairperson that the national party does not want to participate in the primary election and 2) if two or more (presidential) candidates file declarations of candidacy with the secretary of state. That provides Democrats in Nevada with an out to continue with the caucuses/convention system. They only need the chair of the DNC to notify the secretary of state that it does not want Nevada Democrats participating in the primary. Now, this is a bit of an odd maneuver. The legislation cedes the power over the opt-out to the national party. [Keep in mind that because the RNC wants a Nevada primary, it can do nothing and get its preferred position.] 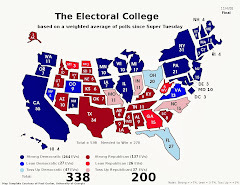 Ultimately, the presidential nomination process is a national party process, but on matters like these the national parties have tended to defer to the state parties (unless it is something in direct violation of the national party delegate selection rules). There is some brinkmanship to this, intentional or not. This is daring the DNC to weigh in on a heretofore state party matter and basically say that it supports a lower turnout election in an early state that just so happens to be a swing state in the general election. That is pretty speculative though. If that provision is in there, then why did Nevada state Senate Democrats vote against the measure? That can get a bit complicated. If the DNC does not take the bait in the trap described above, then Nevada Democrats are forced into a primary election that "violates" national party rules.1 But Nevada Democrats could apply for a waiver from any penalty under Rule 20 of the DNC rules. All a state party has to do is prove that Democratic legislators acted to prevent the legislation from moving forward. As Democrats are in the legislative minority in Nevada, those state Senate Democrats did everything they could to prevent the change in unanimously opposing the move. That possibility is a long way off in all of this. But there is never a dull moment in Nevada presidential nomination politics. 1 FHQ uses the quotation marks here because technically Nevada and the other carve-out states have violated the timing rules in each of the last two cycles. The dates on which Iowa, New Hampshire, Nevada and South Carolina were to hold their contests were clearly laid out in the DNC delegate selection rules. Yet, there was no penalty levied against the early four states.